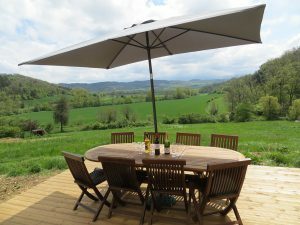 Le Cazal sits just south of the pretty Ariegois village of Manses and has stunning, unspoilt views over open countryside and the rolling Lauragais hills to the majestic Pyrenees. 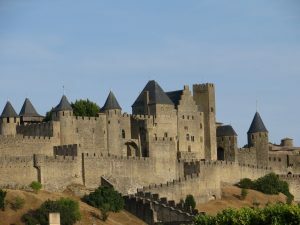 Cathar Country, Castles, Prehistoric Sites, History! Set in over 100 acres, Le Cazal is a tranquil haven but within surprisingly easy reach of major routes and airports. Situated just 5 miles away is the lively mediaeval bastide town of Mirepoix, with shops, restaurants and pavement cafés as well as a twice weekly market. Due to its enviable position, a stay at Le Cazal can be one of complete relaxation and lazy days by the pool or a peaceful base between days of activity in the mountains, sky, water or exploring the historic Cathar sites. The pool is UV sanitised so there is no harsh chlorine or salt. Le Cazal is perfect for holidays all year round. Le Cazal is a 3 bedroom barn conversion with original wood beams set in peaceful countryside within 5 minutes walk of the village of Manses. 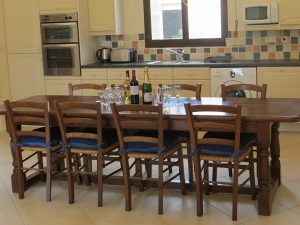 Sleeps 7 people, 2 bathrooms, a terrace and pool and features superb views across open countryside to the Pyrenees. Perfect for an evening’s relaxation after a day exploring or in the pool.